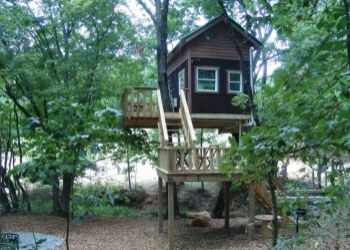 People traveling to southern Illinois to see the Shawnee National Forest, Garden of the Gods, or the Ohio River now have a unique place to stay, tree houses in the Shawnee Forest! Timber Ridge Outpost & Cabins offers a unique experience for families, honeymooners, horseback riders, hunters, fisherman, hikers, bicyclists, bird watchers and star gazers. Nestled in the beautiful hills of the Shawnee National Forest, Timber Ridge Outpost & Cabins offers something for everyone. Come back to a simpler time when families played games together in the evenings and sat on the porch talking into the night. 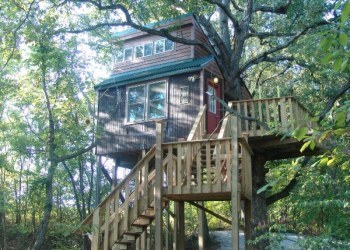 Enjoy some southern hospitality while staying in a real Log Cabin or a one-of-a-kind luxurious Tree House! 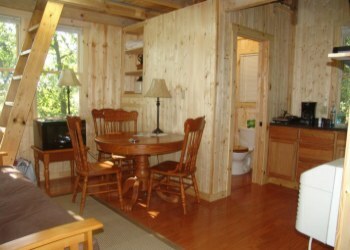 Each of our units, including the Treehouse, is equipped with a bathroom, kitchenette, heating and air conditioning. 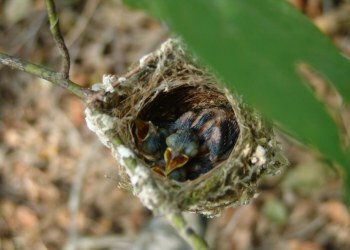 Nest and inhabitant near the cabin. Timber Ridge Outpost is located in southern Illinois near Karbers Ridge, on the Shawnee National Forest. This area lies between the mighty Mississippi and Ohio Rivers. It has some of the most beautiful scenery in the Midwest, such as unique rock formations, caves, spectacular bluffs and canyons. Shawnee National Forest offers hiking, backpacking, hunting, fishing, boating, swimming, camping, picnicking, and scenic driving, in addition, most of the forest is open to horseback riding.